Dynamic Scalper - we found a unique trading algorithm. We have turned forex trading into a real business. 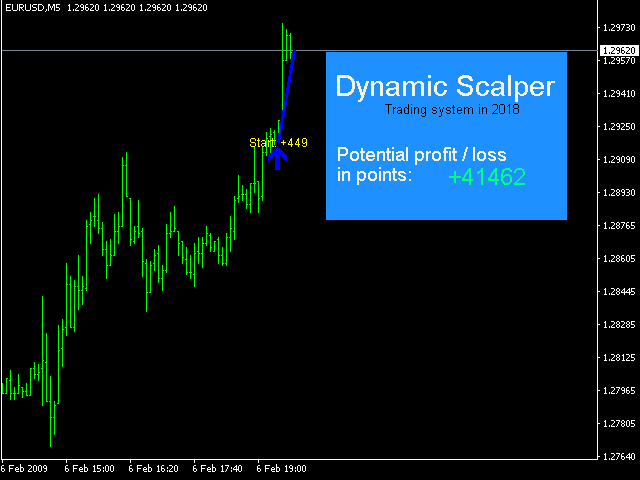 When added to a chart, Dynamic Scalper automatically analyzes the market using an innovative analysis algorithm. The indicator determines the virtual resistance levels, the virtual channel of price movement, the trend and the direction of the dynamics, determines the balance between the bulls and bears. All this he does in seconds so that the trader does not even notice. After that, the buy or sell signal is displayed on the Metatrader screen. The same indicator gives signals to close the deal. 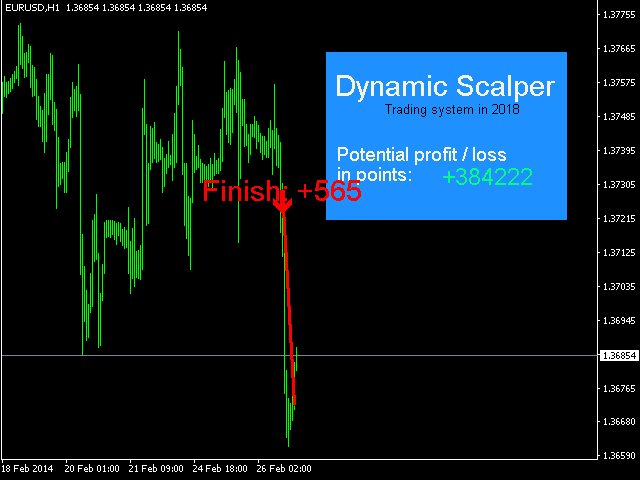 In essence, Dynamic Scalper is a complete trading system. 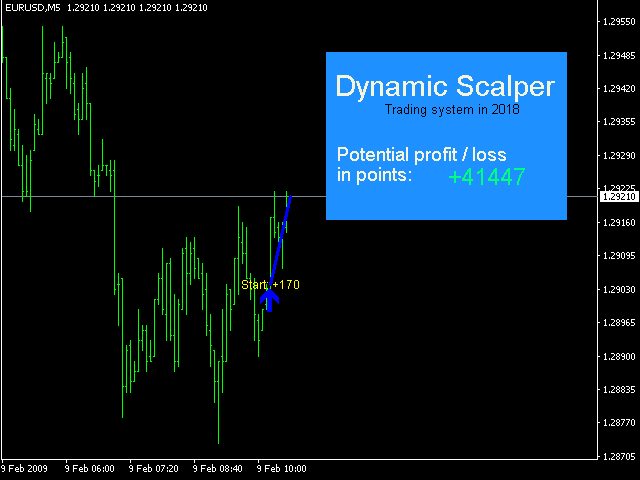 According to it, you can create automatic robots and can be used on any currency pairs and any timeframes. We have tested the indicator on more than 25 currency pairs and all possible timeframes. after the blue arrow appeared - open a buy order. The volume is recommended to set at about 5% of the trade balance or the minimum. after the indicator has written the word Finish - close an open order. after the red arrow appeared - open a sell order. The volume is set on the basis of purchase orders. Important! The indicator does not take into account the spread and swap of your broker, since it cannot be done technically. Therefore, we recommend trading with a broker with a minimum commission. Before you buy, be sure to download and test the robot! 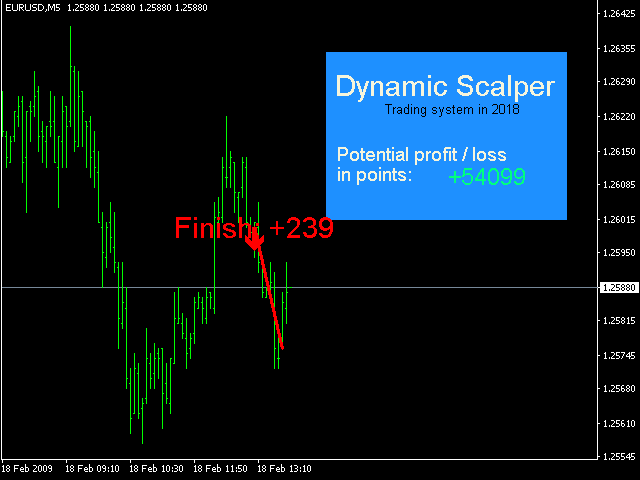 Before trading on a real trading account, set the indicator on a demo account and test. It is built on a completely new trading algorithm. 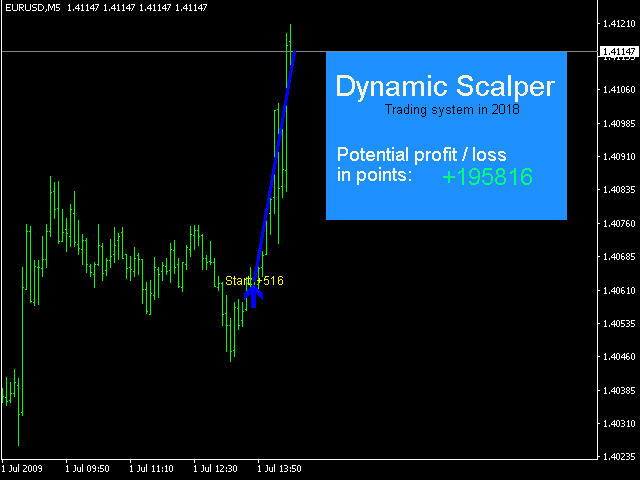 This is the first indicator in which we have applied this trading system. 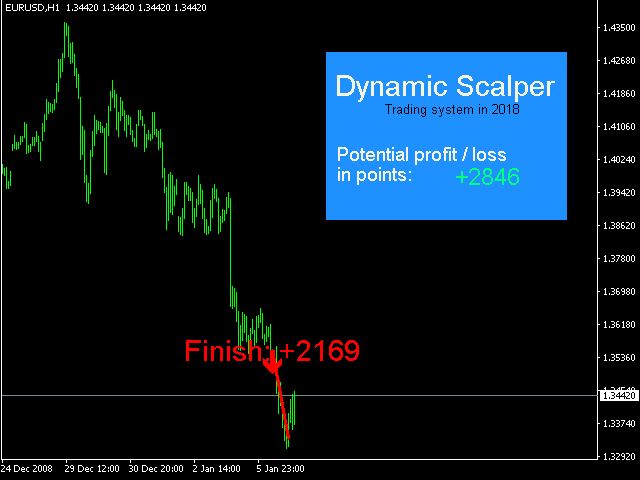 It works on all currency pairs and timeframes. 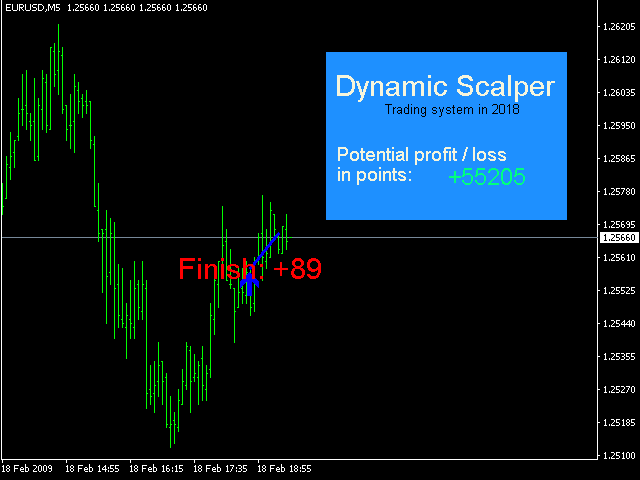 spread - broker's spread for profit calculation. delay_bars - delay in bars between signals. Panel - display of the information panel with the logo. Color_panel - color information panel. i rented the indicator, this is pure cambling. if you have a trend indicator and some moving averages you would be better of. At the request of the user with the nickname new1977, we added the Alerta indicator. Now the indicator, when a signal appears, sends notifications to the phone and email. Also, the "spread" item was added to the indicator settings. 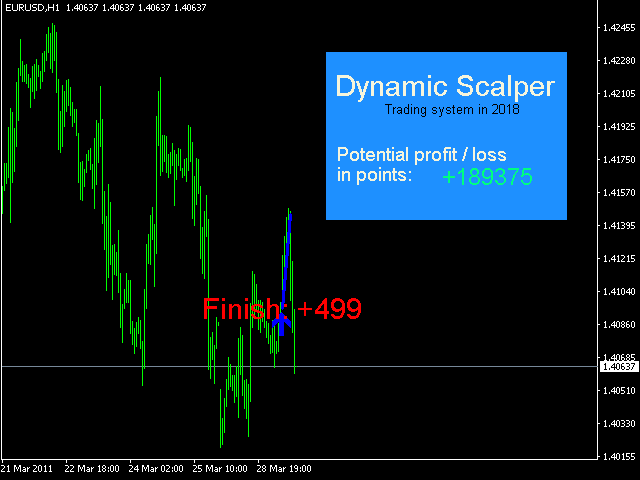 Thanks to this item, the indicator will be able to take into account in the calculations of profit / loss your broker's spread. You need to write in this parameter settings of your broker. Thanks to all customers who make constructive comments on the product and allow us to make it better! You are part of our team and participate in the creation of a more efficient and useful indicator.